The UW is committed to minimizing the impact of emergency and disaster disruptions. That means supporting a comprehensive training and exercise program to ensure key University personnel have the knowledge, skills and abilities to perform essential functions during an emergency. UWEM is in the process of transitioning our training calendar to a new, web-based, online training management system. More information to follow soon. NOTE: Training sessions, workshops and classes/courses offered, coordinated or supported by UWEM are offered and promoted primarily to UW stakeholders (staff, students, faculty and direct partners). Training slots for non-UW affiliated students are provided on an as-available basis. The University of Washington’s annual emergency exercise program was established in 2004 as an ongoing preparedness effort designed to make the UW more “disaster resistant.” The need to conduct regular and ongoing campus-wide drills and exercises involving the University’s Emergency Operations Center (EOC) is critical to ensure the safety of our campus and coordination with regional partners. The annual drill cycle and related improvement process meet UWEM’s overall goal of saving lives, protecting property and safeguarding the environment of the University. UWEM conducts a quarterly drill to ensure that the University EOC staff are fully and capable of responding to an emergency and have sufficient skill and knowledge to work in a coordinated response with partners. Also, the drills provide UWEM the ability to test specific technologies to maintain proficiency and current records. 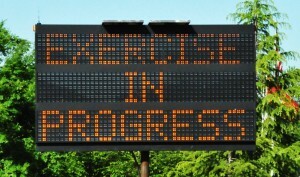 The state of Washington has adopted the Homeland Security and Exercise Evaluation Program (HSEEP) as the state standard. The Homeland Security Exercise and Evaluation Program is a capabilities and performance-based exercise program providing a standardized method and terminology for exercise design, development, conduct, evaluation and improvement planning. The program is a national standard for all exercises.